Now....a finch feeder that is completely squirrel proof. Designed by the world's best family of squirrel proof bird feeders, the Squirrel Buster Finch Feeder stops all squirrels, regardless of how big or small, from getting a seed reward. 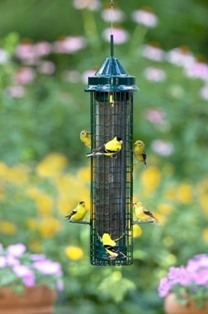 This large capacity finch feeder holds 1.5 quarts of njyer, thistle or your own special finch mix. The all metal construction makes it completely chew proof and has a 2 year, no-hassle FREE warranty. Try getting that from any other bird feeder company that you have purchased before and you will discover why this newest family member of the Squirrel Buster line is a total hit with our customers!